Light from the sun is our most abundant source of renewable energy, and learning how best to harvest this radiation is key for the world's future power needs. 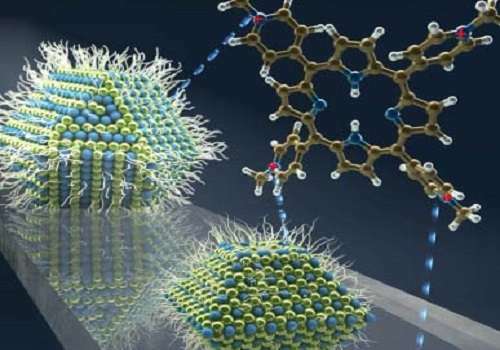 Researchers at KAUST have discovered that the efficiency of solar cells can be boosted by combining inorganic semiconductor nanocrystals with organic molecules. Quantum dots are crystals that only measure roughly 10 nanometers across. An electron trapped by the dot has quite different properties from those of an electron free to move through a larger material. "One of the greatest advantages of quantum dots for solar cell technologies is their optical properties' tunability," explained KAUST Assistant Professor of Chemical Science Omar Mohammed. "They can be controlled by varying the size of the quantum dot." "With this approach, we can now extend the quantum dot size for efficient charge transfer to include most of the near-infrared spectral region, reaching beyond the previously reported cut-off," stated Mohammed. "We hope next to implement this idea in solar-cells with different architectures to optimize efficiency."